Some of Yukihito Masuura’s most intimate photographs are of pieces of wood. In these close-ups, the grain fills the frame, and scale is an afterthought. It’s easy to mistake them, at first, for giant boughs of driftwood, or clouds of interstellar gas, or the jagged slopes of a craggy mountain. Through Masuura’s lens, the images feel monumental. 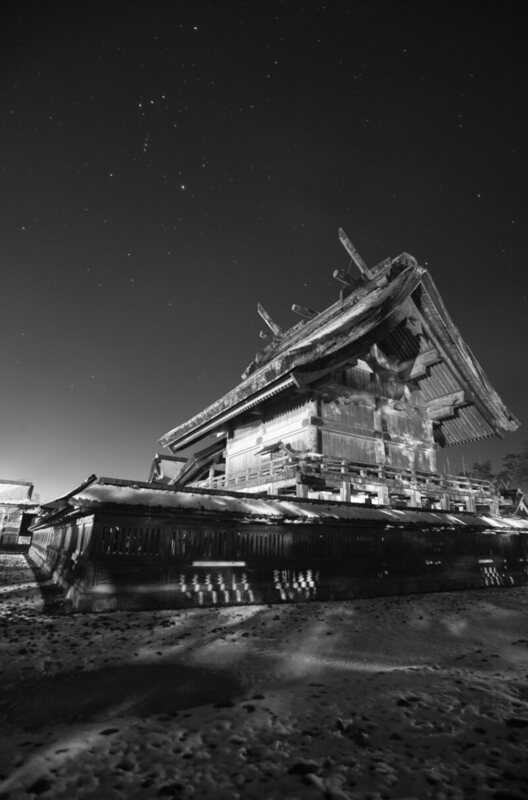 To hear him tell it, they hold everything a viewer needs to know about the subject of his recent series: the process of reconstructing and reconsecrating Japan’s Shinto shrines. For Masuura, this old wood represents the tug of the past in the present. Three cedar fragments in his images were excavated nearly two decades ago at the Izumo Ōyashiro shrine, also known as Izumo-Taisha, in Japan’s Shimane prefecture. The fragments, which traveled to the Tokyo National Museum, are roughly the height of people who stop to bow in front of them. They are thought to have been parts of the large pillars that supported the shrine in centuries past, and they help bolster historic accounts that the structure once towered several hundred feet tall. It has since been rebuilt several times, in a ritual known as sengu, repeated at regular intervals (that vary by shrine) for roughly 1,300 years. Shintoism, which has ancient roots and was codified in the early eighth century, is a religion that recognizes the sacred potency of landscapes, spirits, ancestors, and more (known as kami), and emphasizes the linking of past and present. During the recurring reconstruction rituals, some Shinto shrines are overhauled more completely than others. In some cases this involves remaking entire buildings and the furnishings inside, as has been the case at the Ise Grand Shrine (also known as Ise Jingu), which is rebuilt from scratch every 20 years. Other cases are more like renovations. In either event, the idea,according to the Association of Shinto Shrines, is that the renewed spaces rejuvenate the divine spirits worshipped there. “We’re always making these structures new for the gods,” Masuura says, through a translator, at a recent, brief exhibition of the series at Foto Care in New York City. Because local people participate in the process, the rituals also sustain historic construction techniques, and transmit and reinforce cultural beliefs. The activity often give tourism numbers a boost, too. When the shrine of Izumo-Taisha was freshened up in 2013 for the first time in 60 years, it drew a record eight million visitors, more than double the year before, the Japan Times reported. 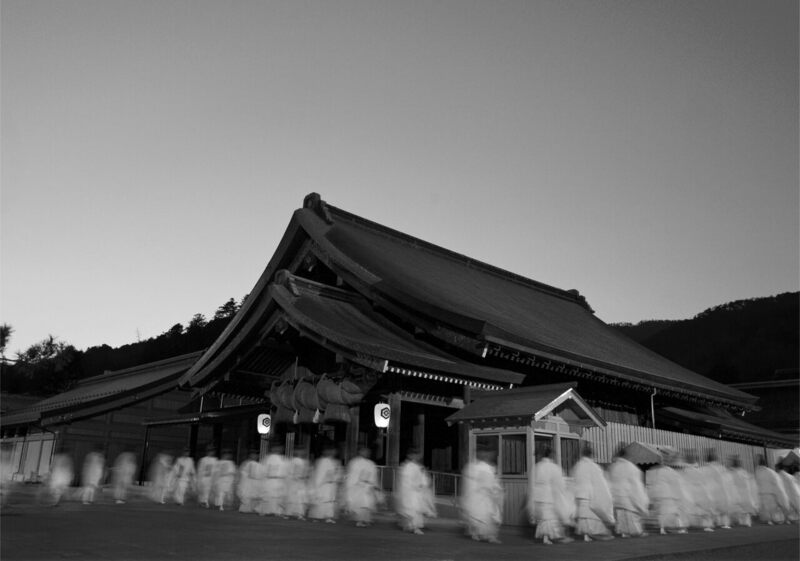 Masuura began photographing shrines and their associated rituals in the early 2000s, and he kept at it for 14 years. When those pieces of cedar were excavated at Izumo-Taisha, Masuura interpreted them as poetic symbols, and proof that the present is tethered to the past. No one set had out to find evidence in the ground, he says, “It just happened.” That indelible, insistent, evocative quality emerges in his images. During the ceremony to relocate enshrined deities, the shrine is covered. For several years before embarking on this project, Masuura had worked on commission to photograph sculptures in museums’ permanent collections. In France, he became captivated by the hands, torsos, and feet that Michelangelo coaxed out of stone. He was drawn to the sense that there was something powerful and magnetic about the inanimate bodies, he says, beyond their obvious aesthetic qualities. For Masuura, the old, warped wood recalled something similar. For the photographer, the wood evokes the idea of kehai, which loosely translates as “the presence of something.” He hopes that someone looking at his photos would feel that presence as well, then and now. 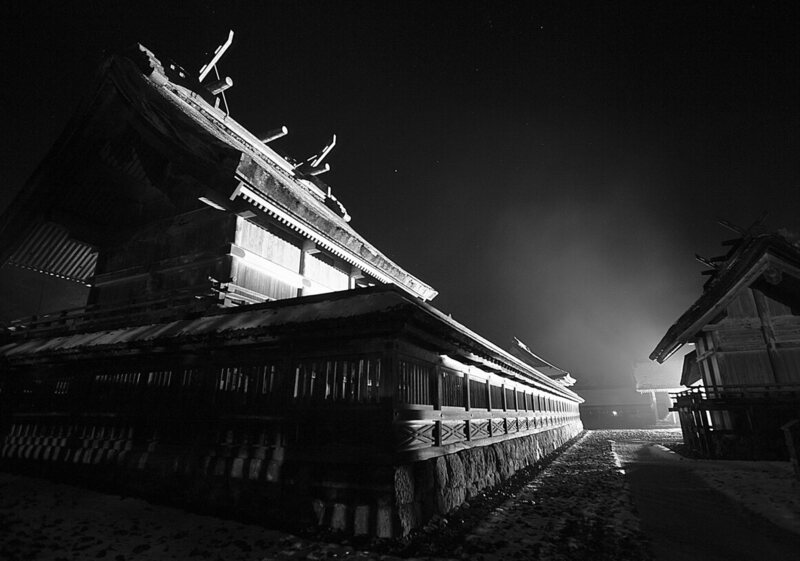 He visited the shrines frequently, and usually at night. “The gods are thought of as being something that you should not see, so I went when they are not visible,” Masuura says. Some of his drop-ins overlapped with the renovation project at Izumo-Taisha, and he photographed the ceremonies that moved the gods to a new home while it was underway, and the ones that reinstalled them at the conclusion. Rebuilding and reconsecrating shrines may involve several rituals over many years. 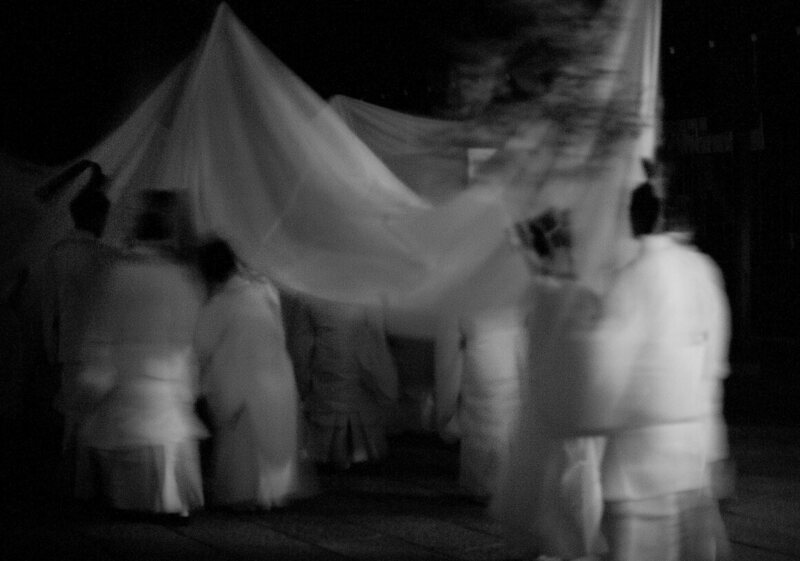 Many of the resulting images are enigmatic: One includes several people holding shrouds over something—it’s not clear what. (Masuura says it’s a portable shrine, and since onlookers aren’t supposed to gaze directly at a god, the attendants “are covering it with a white cloth to conceal what’s underneath.”) Other images are pragmatic celebrations of the joints that loft the balustrade, and still others are atmospheric, such as one in which light floods tree branches, setting a whole scene aglow. Across the series, the themes of change and continuity sit alongside each other. They’re especially clear in a photograph printed as a panorama on washi paper. The shrine, in the background, is in crisp focus, while the procession in the foreground is blurry, almost ghostly. It seems to suggest that the priests and the tradition simultaneously stretch into the past and wrap toward the future.